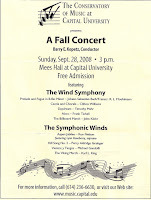 On Sunday, September 28, the Capital University's premier wind ensemble will present their fall concert at Mees Hall on the campus of CU. The concert is at 3 PM and admission is free. The Wind Symphony will be performing the Moehlmann transcription of Prelude and Fugue in Bflat Minor by Johann Sebastian Bach, Caccia and Chorale by Clifton Williams (one of my fav composers), Daydream by Timothy Mahr (you've played it! ), Nitro by Frank Ticheli, and The Billboard March by John Klohr. The Symphonic Winds will perform Aspen Jubilee by Ron Nelson, Hill Song No. 2 by Percy Grainger, Vientos y Tangos by Michael Gandolfi, and The Viking March by Karl King. 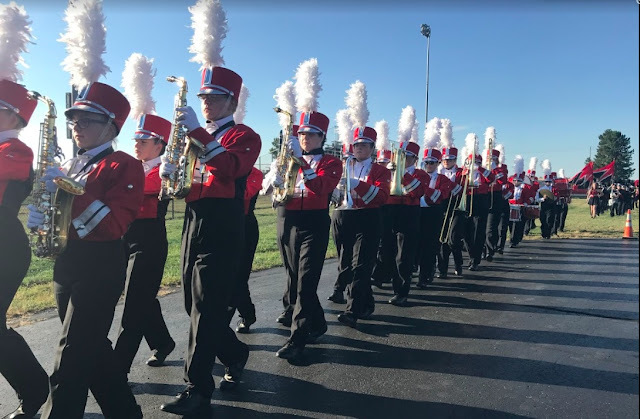 What a fantastic program! And it's all FREE! Don't miss this amazing opportunity. For more information, call 614.236.6630 or visit their web site at www.music.capital.edu. (click the pic to enlarge) Bonus point will be available for FHSCB and JHCB members who attend and show proof of attendance.